This project was to promote good sleeping habits and to help people learn the value of sleep through a system of products. This system includes a physical, environmental and digital piece that targeted the students of CMU. 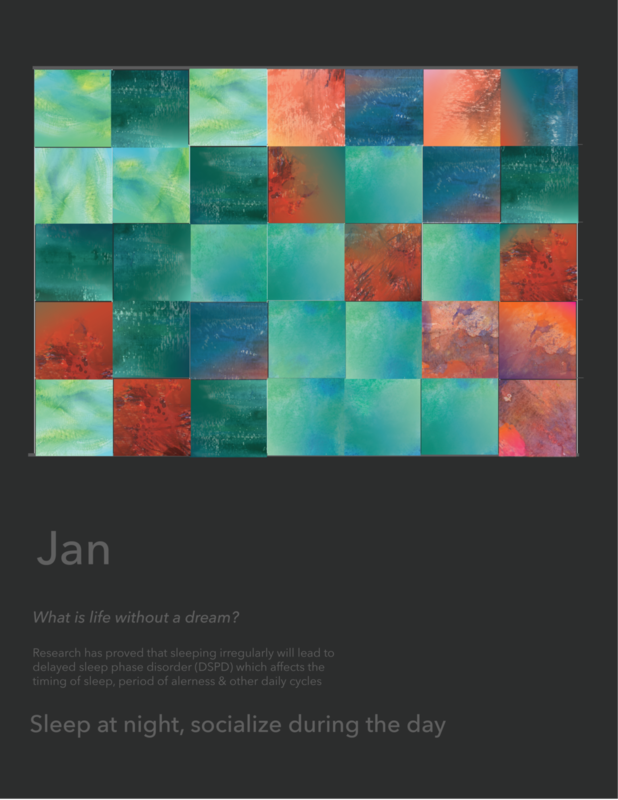 In this project, our final products included an interactive calendar that shows the value of sleep through visualization of the hours of sleep on gets, a fun environmental simulation to promote good sleep through an ideal dream state, and a notification addition to the Apple Calendar app that notifies users if they are not getting enough sleep. Students found sleep to be the easiest to sacrifice out of education and social life, because losing a few hours of sleep doesn't have as immediate consequences as not studying for a few hours. Because of CMU's rigorous study environment, students are pressured to not getting enough sleep. Most knew they weren't getting enough sleep. 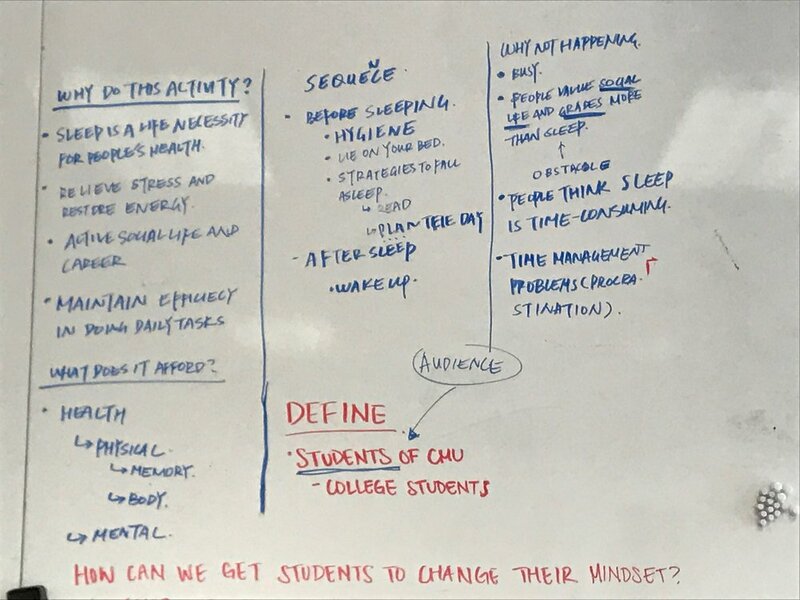 After getting insight of how students really felt about not getting enough sleep, we decided that instead of trying to change students' mindsets and behaviors about sleeping habits by forcing them to get more sleep, we decided to focus on raising awareness and inform students about the importance of good sleeping habits. To do this, we created a visual vocabulary that will guide our final products into becoming more unified as a system. This included different catchphrases, visual styles, and system parameters. For our system, the use of watercolor textures and a distinct color palette is the main visual unifier of our three products. This interactive calendar prompts users to log the amount of sleep that they had everyday through expressive stickers that each have a different visual style corresponding to an hour amount. With these stickers, users will put them on each day, and as time goes on, the calendar will start showing a visual trend of the user's sleeping pattern. If the user finds that their calendar is too much of the lower colors, they will be aware that they are not getting enough sleep, therefore prompting them to start adapting better sleeping habits. Accompanying this, there are different quotes and research studies of sleep that will help inform good sleeping habits. To create the mood of sleep, subtle and desaturated colors were used so that a calm mood can be created. Type of the calendar itself was toned down to create more emphasis on the stickers. For the form of the calendar, bigger pages were used to make the visual trend of the stickers more visible, and pockets for stickers so that they are more accessible. The final product was spiral bound and backed by cardboard. In this environmental piece, set up as an event on campus, lets students create their ideal dream state using textured blankets and a chalkboard. This will allow students to want to have more sleep, therefore thinking about including more sleep in their life. After they create their dream state, students can share their creation on social media, using hashtags to spread the awareness of the importance of sleep and the event. 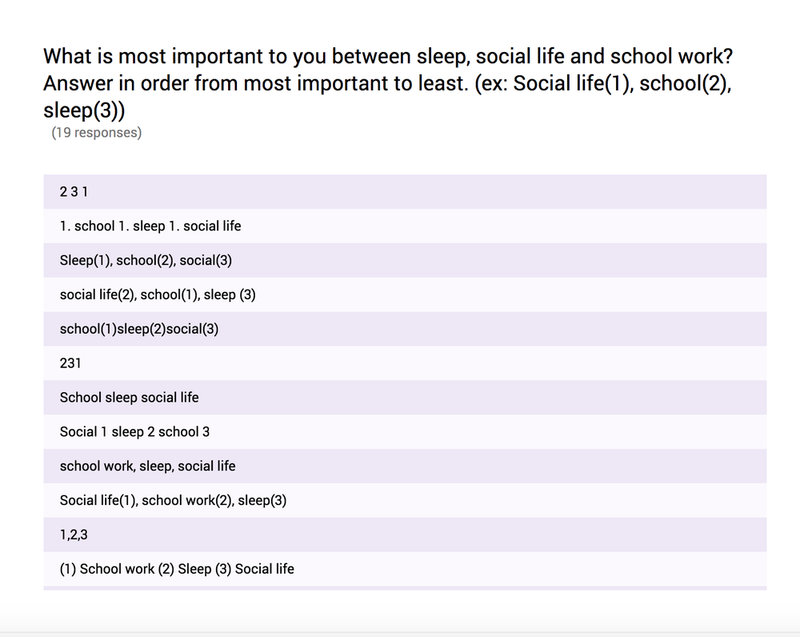 From our survey, we found that students prioritize sleep the least, making it more vulnerable to ignore the importance of sleep. But what if you were steadily, and subtly notified on when you should be getting sleep and sleep facts? With this addition to the calendar app, after you input your schedule for the day, it accommodates to your schedule and tells you when you can fit sleep into your schedule. We made our final product as close to the real Apple app as possible, but also added additional visual components to make it comply to our visual system. For the full experience, go here.